The original handy tool for all serious anglers. Made in USA of USA materials. The BogaGrip works by encompassing the fish’s lower jawbone. It incorporates a precision weighting scale. The one hand operated gadget is made of stainless steel. It comes in three sizes: for use up to 15 lb; 30 lb; and 60 lb. The BogaGrip features four functions acting together that allow it to work nearly flawlessly. 1. The BogaGrip jaws are arranged such that the weight of the fish will cause the jaws to shut even tighter. 2. It has a locking mechanism that keeps the jaws in their tightest position. 3. 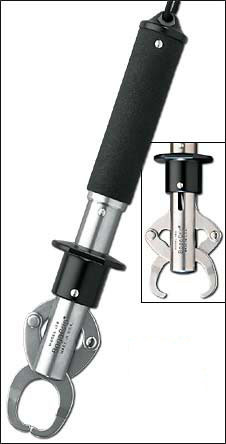 It has a swiveling motion that eliminates the torque a spinning fish may cause. 4. It has a shock absorber that dampens a fish’s attempt to get free. 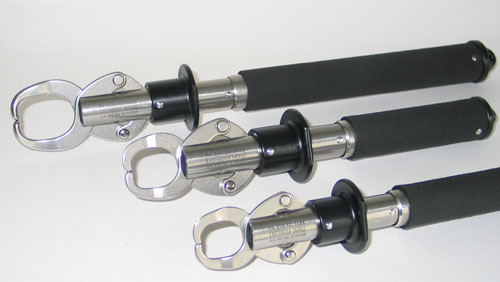 The BogaGrip is made in the USA of USA material. All metal parts are made of stainless steel. All plastic parts are made from black acetal which is a high performance engineering thermoplastic that is used in unlubricated bearing applications. Acetal is tough and resilient and is very resistant to UV light. Because of the high grade materials used, BogaGrip is very strong and resistant to conditions encountered while fishing in FRESH or SATWATER. Each BogaGrip scale is calibrated with certified weights to ensure accuracy within one increment. You can send your BogaGrip to IGFA (954-927-2628, Dania Beach FL)where they can certify it for world record catches. You can operate it quickly with one hand. The BogaGrip easily emcompasses the lower jawbone of most speciaes. It will not rub off a fish’s protective slime layer, and provides a hassle-free way of handling fish. You can use it to take your prize pictures and release it unharmed back into the water. A rubberised grip gives you a firm grasp. The main tubes contains a precision scale that is calibrated using certified weights to ensure extreme accuracy.